Churros are Spanish donuts – deep fried until golden and crispy on the outside and fluffy in the middle. 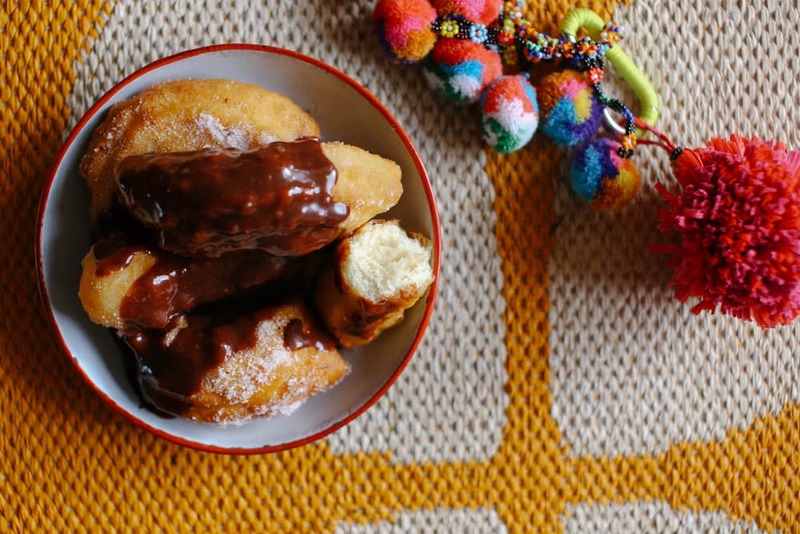 Our churros are always a big hit – tossed in caster sugar and served with a rich chocolate sauce with a hint of chilli. Yum! For the churros, combine the water, butter, sugar and salt in a medium-saucepan and bring to the boil on medium heat. Sift in the flour and stir over the heat for one minute. Transfer to the bowl of an electric mixer fitted with the paddle attachment and with the speed on low, add the eggs, one at a time, beating well between each addition. Transfer mixture to a piping bag fitted with a large star-shaped tip. Heat the oil until a little of the dough fries and becomes golden when tested. Pipe in 5-10cm lengths of the dough (as you prefer) and fry in batches until golden. Dust in the caster sugar. For the chocolate sauce, melt the chocolate in a bowl over a saucepan of simmering water until smooth. Stir in the cream and chilli powder. Serve warm with the fresh churros.